Or: How I learned to stop worrying and love the Y-seam*. I happened to have a large piece of sweatshirt fabric which makes a great platform for arranging the blocks. I arranged the blocks so there are hardly any blocks with orange centers next to each other. I think the overall effect isn't too "orange", so I'm pleased with it, at least so far. 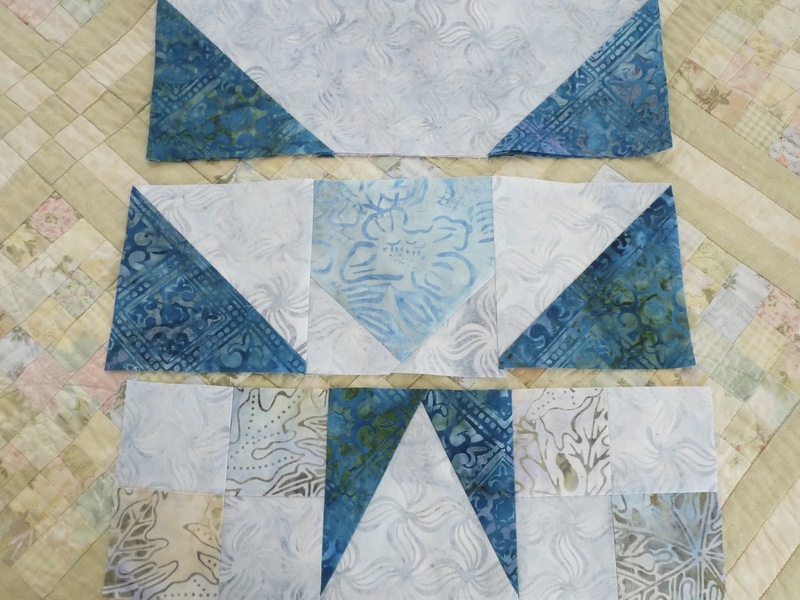 I am not using the traditional layout of offsetting the blocks that you usually see on GFG quilts. Instead, I am setting them side by side, with lots of light colored connecting hexies in between. This has the overall effect of lightening overall color of the quilt. I am also adding some colored blocks to add a bit of interest and so as not to lighten it too much. I was idly thinking of putting together a tutorial on machine sewing hexies, but then I found this excellent YouTube video, which explains the piecing process extremely well. 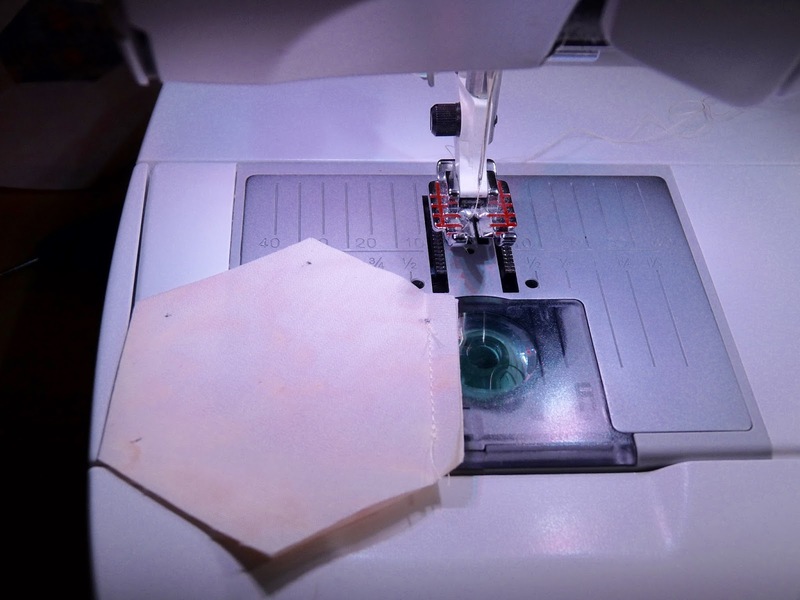 It focuses on a product to print the fabric with the sewing and cutting lines, but the basic sewing can be adapted for use without the printing. There are a few other videos out there that explain machine sewing hexies, but I think this one is the best that I've seen. What I've done is to make a cardboard hexagon, shown above, and carefully made holes at each intersection. 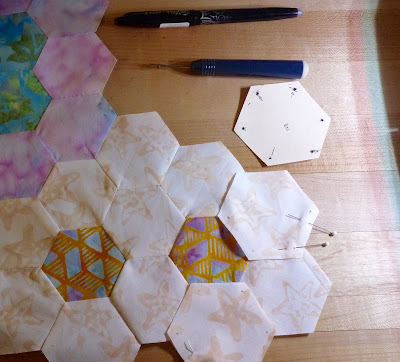 After transferring these to the fabric hexies, it's easy to sew from one point to the other. I have to apologize for the poor quality of photographs. One of the things I really want for my new sewing room is a photo station, with lots of lights so I can get good closeups. Also, when sewing the blocks to the connectors, I've discovered that it helps to number the blocks, so I don't sew the wrong ones together. I'm using a Frixion pen, so the marks all disappear when the pieces are pressed. 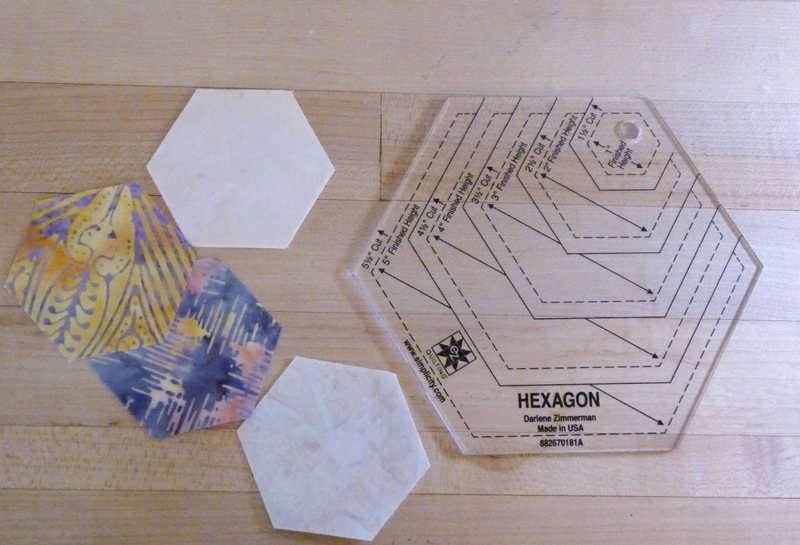 A few other notes about machine sewing hexies. First, accurate cutting is vitally important! If your hexies aren't perfectly cut, there is no way in the world you will end up with a precisely pieced quilt. I used a Hexagon Ruler by Darlene Zimmerman, also available at Joann's Fabrics. I was careful to cut no more than three layers of fabric at a time, to ensure accuracy. Second, know your machine and its capabilities. I used the quilter's piecing foot and the straight stitch throat plate, which helps with precision sewing. 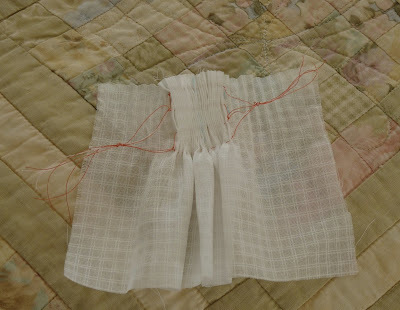 I also noticed that when I start stitching, the fabric slides backwards just a bit, not even a millimeter, so I would position my mark towards the back of the hole in the foot. Third, never sew into the seam allowance, not even half a stitch. 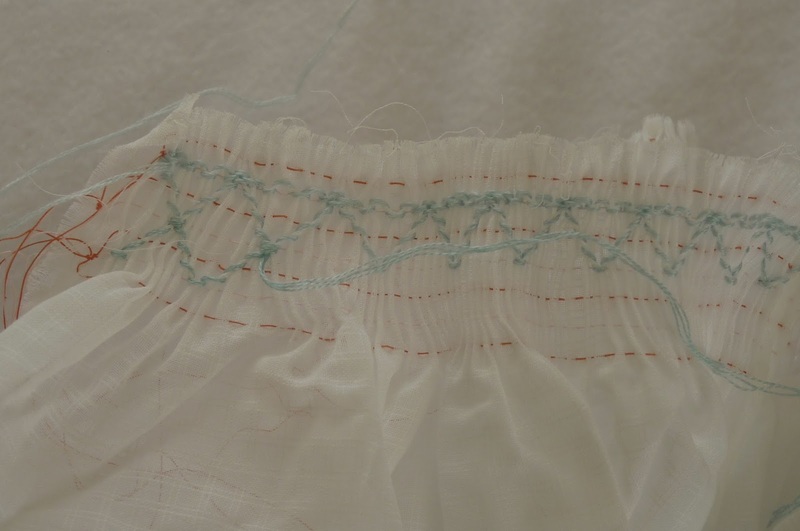 If you are not able to position the needle to sew precisely enough, it helps to sew the seam a bit short. You will be able to pivot the hexie for the next seam and the gap won't show. One video I saw mentioned to use the locking foot, but I found that backstitching one or two stitches at the beginning and end of each seam to work much better, and was easier to rip out if I needed to. Which I did, at least at first. The video in the link above recommends using the needle down position, but I found the needle up position to work better for me. When the needle stops in the down position the foot rises just a bit. Then is great for sewing curves, but not for this application. I prefer the presser foot to be firmly on the fabric at all time. I found that steam pressing the hexies really helps. I know there is a feeling among many never to use steam when pressing quilt pieces, but in this case I find it essential. I also steam pressed all the seams prior to sewing the blocks together on the Blue and Cream Quilt. 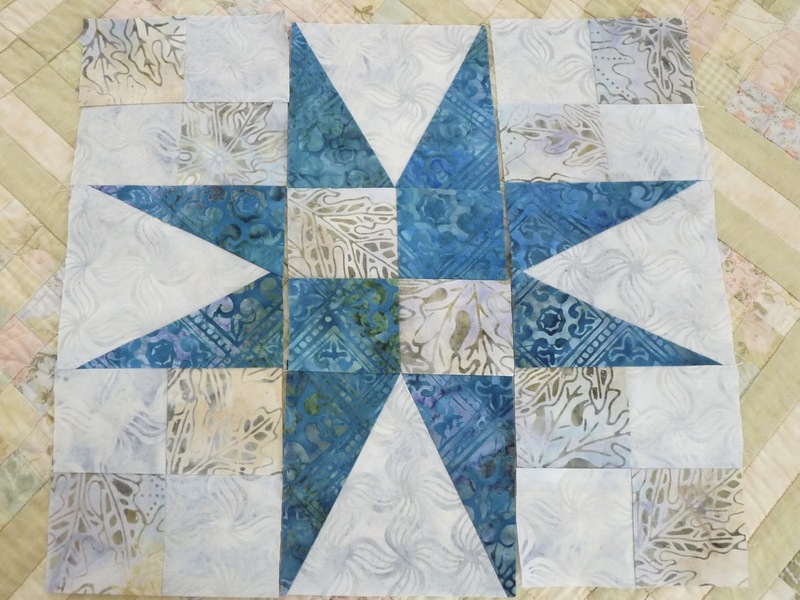 Speaking of which, the Blue and Cream Quilt has been completely pieced and quilted, but not bound. Once it is out of storage, I'll finish that project with a post. After each sewing session, I can roll up all the pieces in the sweatshirt fabric, and lay it aside so we can sleep in the bed. Sort of a removable design wall. If you would like to see the progress of this quilt to date, just click on this link! * For my non English speaking readers, the title of the post is a play on the movie, Dr Strangelove or: How I learned to stop worrying and love the bomb, a political black comedy loosely based on the novel Red Alert, by Peter George (which I actually have read). Just a bit of alliteration to brighten your day. The blocks are all finished! I've been continuing to machine piece them, and I'm getting better at it all the time. There are still a few wrinkles here and there, but I think once the quilt is put together, they won't be too noticeable. The two previous blocks look quite similar, but the aren't. 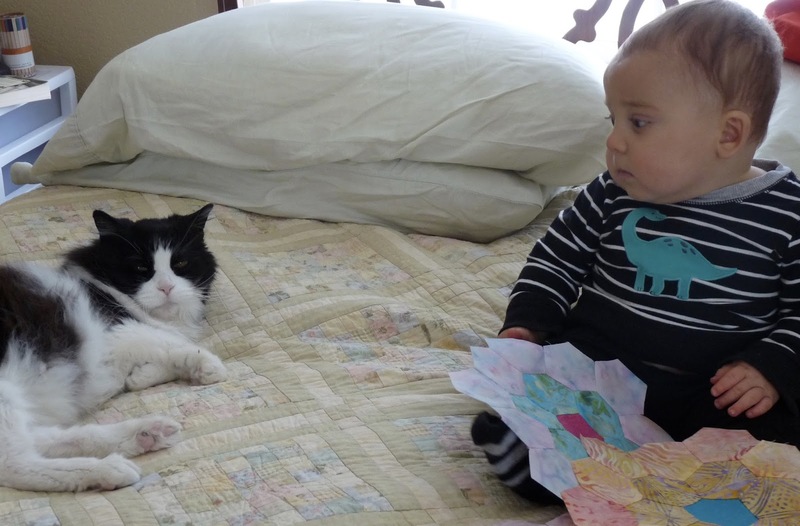 I'll still place them far apart on the quilt. At first, I was afraid that there is too much orange in the quilt, as I had more orange centers than other colors. Even these with purple centers read orange. Of course, there is nothing wrong with orange, just that I didn't want an orange quilt. I won't be able to tell how orange the quilt will turn out until I put it all together. Next post, arranging and sewing the blocks and the connectors. My QA guy is bored with the blocks, and declined the photo shoot. I've been pretty busy with the Grandmother's Flower Garden Quilt, and getting in a lot of TV time while I'm working it. But the hand sewing has been hard on my fingers, as I tend to stab into them to make sure I've penetrated both layers of fabric. Then I thought, since I am marking each of the corners for accurate placement, if I've very careful and slow, I should be able to do this on the machine, right? And yes, Blocks 25 - 27 are all machine sewn. I'll take some good photos of the process to share with you. I was able to sew three of them in less time than it takes to hand sew one. I'm sure many will say, but hand sewing is so relaxing! Yes, it is, but I have plenty of other projects that require hand work. But he wants this moving toy! Only eight more flower blocks to go, and all the connecting pieces, and I'll be ready to put it all together. I've been looking for quilting ideas, and have come across a few on, where else, Pinterest, but I need to document them for future reference. I may quilt this myself, in spite of my long standing aversion to quilting. This is a pretty boring post, just showing how much progress I've made on my Grandmother's Flower Garden quilt. And yes, they are all hand pieced, which is a bit more forgiving than machine piecing. I can steam out quite a few little imperfections so the flowers all look pretty nice. Whether they all go together well remains to be seen. 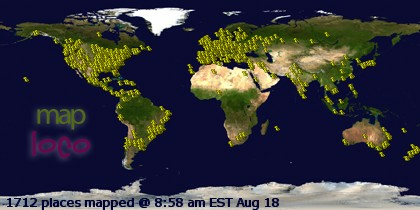 So far, no more duplicates, and I don't think there are any more. I mentioned previously that I had kitted all the flowers, so all the pieces are sorted for piecing. 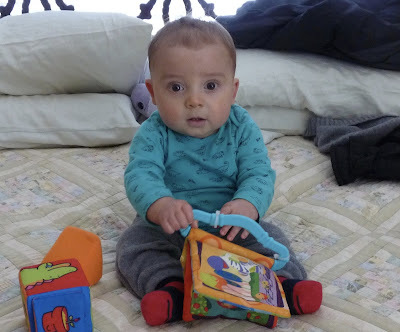 We are watching this little guy almost every day now, and I have to say it is so much fun. He's much more interested in his book at this point than the quilt. Only 16 more flowers left to piece, and of course, all the connecting pieces. This will be a twin sized quilt, for a day bed I plan to purchase for our new home. The quilt on the bed is one I made about 15 years ago. I purchased an entire set of fat quarters of a Moda collection, along with beige and green Moda Marbles for the sashing. The blocks are seven one inch (2.5 cm) squares on a side, making the finished blocks seven inches (17.75 cm) square. The sashing strips are three one inch strips with three inch (7.6 cm) blocks at each intersection. When I made the quilt, I was doing quite a bit of traveling to our test site in the Antelope Valley, north of Los Angeles. Since often I couldn't do any testing due to the weather, I would bring my sewing machine and fabric and would piece away in the hotel. I have to say, it worked pretty well. 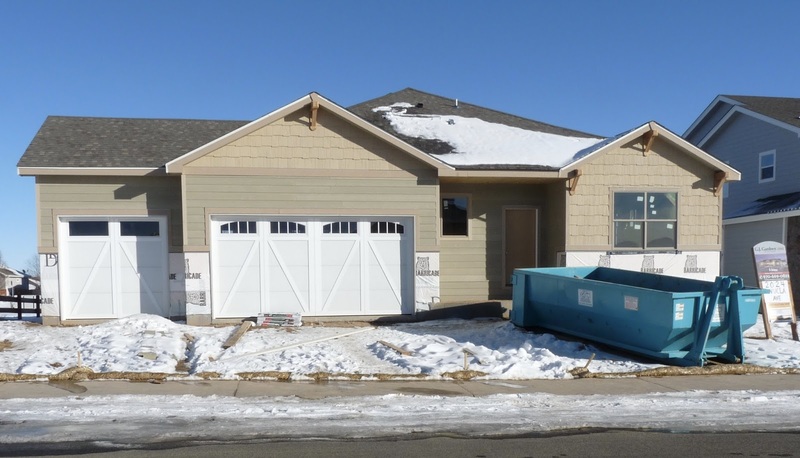 It's snowing here in Northern Colorado, but since the new house now has the windows and doors installed, the builders can work inside in relative comfort. This is the latest photo of the house, taken between Christmas and New Year's. The garage doors have been installed, along with the blank front door. A blank is used until all the finish trim work and painting is completed, then the real front door will be installed so as to avoid any damage to it. 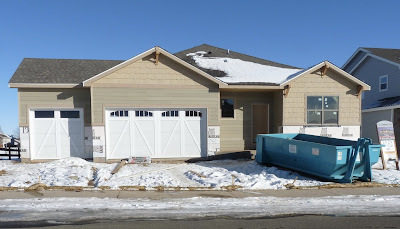 Notice the windows on the small garage door are different from the main door, the builder will look into it next week. All the plumbing and HVAC venting is installed, even the hot water heater is there. Just nothing is hooked up. We had the electrical walk through last week. I've added a good 25% more outlets than was in the original plan, figuring you can never have too many. On the advice of our youngest son (the theoretical physicist) I'm having ethernet connectors installed in the bedrooms and family room. That way we can rely on wireless only for phones and tablets. It makes for much more reliable connections and faster download speeds. It should be finished sometime in March, and we will move in by mid April. Don't worry! 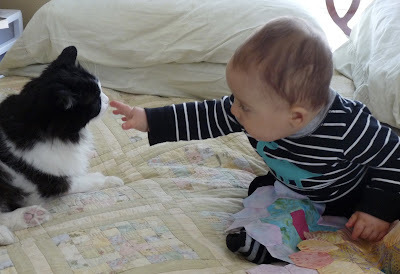 I'm not doing a retrospective of 2015 nor a preview of 2016, except for a few immediate and one very large project. This coming Monday, Jan 4, I will be attending a function at our local library to help show what the library has to offer the community. So this weekend I intend to get the Dimity Dreams dress into shape, to show that smocking is alive (barely) and well (slightly) in Northern Colorado. Since I'm in the Tatting Group that meets at the library, this is what I'll be working on. I made the hanky with some fine handkerchief linen and am tatting an edging for it. It's not the super fine, No 80 tatting thread but instead a somewhat respectable No 50 DMC Cordonnet. I'll sew some of it on to show how to attach the edging to the hanky. But I'll also show the smocking in the above photos, bring some flyers and extra copies of the SAGA Newsletter, and try to generate some interest. In case you are wondering, I do have permission from the library staff to do this. I will finish the back smocking, then construct the dress as much as possible to have something nice to show. My big project is of course my new house, and I'll post an update on it later this week. One item I really want in it is a photo station. It is sadly needed, as you can tell by the poor quality of photos. It's now Friday morning and time to turn on the Twilight Zone marathon!